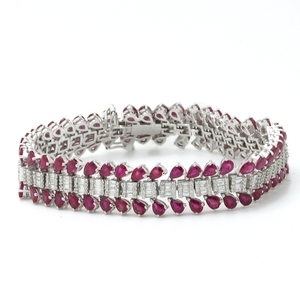 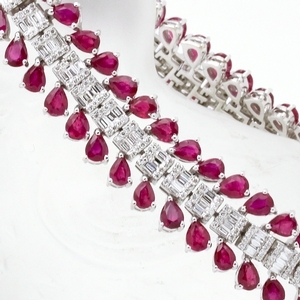 Pear Ruby & Baguette Diamond Bracelet at Reliable Gold in Providence, RI Reliable Gold Ltd.
For the ruby fans, this stunning flexible bracelet has it all! A center row of baguette and round diamond, approximately 2.26 carats total weight, is flanked by a top and bottom row of pear shaped rubies, approximately 13.81 carats total weight, in 18K white gold. 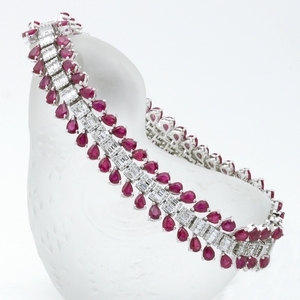 A bracelet to be reckoned with!